The ASME Code requires each fired-boiler drum operating at up to 400 PSIG (27.5 Barg) to have at least one gauge glass and two gauge glasses for all boilers operating at higher pressures. The gauge glass must be visible to the boiler operator at the place where immediate control action is initiated. Furthermore, there are gauges available that are unsuitable for steam service. Since steam and water can appear very similar, it is important to ensure that the operator has a continuous view of the steam-to-water interface. In the case of gauges which are in sections, these sections must overlap, or alternatively bi-colour gauges which show a clear difference in the presence of steam or water may be used. Due to the fact that bi-colour gauges use refraction to contrast the presence of steam and water, it is essential that these gauges are fitted with their appropriate illuminators which provide this functionality. On a fired-boiler drum operating at above 400 PSIG (27.5 Barg) the ASME code permits that one of the two direct reading gauges can be replaced by two remote reading gauges. Due to the fact that the direct reading gauge is considered the verification of last resort it is essential that there is at least one functioning gauge glass at all times. When two Indirect Reading Gauges are used to meet Section 1 requirements, both of these gauges may be kept isolated, but must be maintained in serviceable condition. Both remotes reading gauges must operate independently and must be continuously displayed. Wide-Body construction for extra strength and rigidity. Glass is tested for surface trueness and is protected by a high grade mica shield. Tempered Borosilicate Glass to resist thermal shock for gauge models FG400, FG900 and FG1500, and Aluminosilicate glass in the FG2000 model. All models feature a finger-clamp design which ensures a uniform perpendicular load across the glass surface and ensures gasket tightness. This design also facilitates easy dismantling for cleaning and servicing. For best results and easier viewing of a Flat Glass Gauge the fitting of a DuraStar Illuminator is recommended. This LED-style illuminator functions by placing a bright “Star” on the water meniscus which can be seen from a distance away. It is supplied with a clip-on bracket for easy installation and is available in both 120 VAC and 240 VAC variants. The latest version being 30% brighter. This gauge operates on the reliable principle of light refraction. It differentiates between steam and water because light refracts through the steam and water differently. 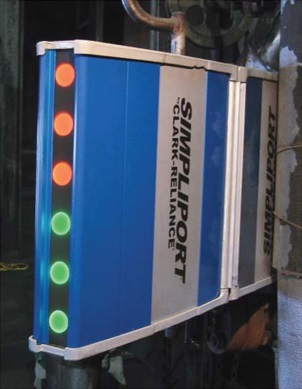 The Simpliport gauge when fitted with its appropriate illuminator indicates the presence of water with green ports and the presence of steam with red ports. With a worldwide footprint established in 1962, Simpliport® Level Glass Gauges provide reliable bi-colour indication up to 3000 PSI (206 Bar). Continuous improvements to the Simpliport design have made them easier to install, easier to maintain and now, much easier to view. With the latest model illuminator, the Simpliport 180 , you will see the level clearly when standing within 180° of the Simpliport Wide Angle Hood. In most cases, it precludes the need of installing floor-standing mirrors because it provides clear and bright indication from almost any angle, at any distance. It can be installed outdoors or under cover and can be supplied in both 120 VAC and 240 VAC variants. It is also the only high pressure gauge with a repairable body thus reducing the cost of ownership to the plant. It is considered good practice to position all alarm and trip activation points within the visible range of your direct reading gauge. This will assist the operator with instrument calibration. Steam and water connections should be as short as possible and should be appropriately lagged to prevent excessive cooling in the steam connection of boiler trim. This cooling will result in condensate continuously forming and running into the equipment from the top and can cause the level in the gauge to appear higher than in the drum. It can also make the reading of a gauge level very difficult. All gauges and boiler trim should be installed with isolation valves which allow for removal of the equipment for maintenance. Generally we recommend that all boiler trim be supplied as weatherproof. This is because of the occasional tendency to hose down the area around the drum.